Pr. Peters has this great post on the duties parents vow to fulfill prior to baptism. I, like him, have no good answer to the question he poses, even though I've asked it over and over again. We generally eat very well in the Hemmer household. Today was the epitome of fine dining. It began with a breakfast of eggs over medium, covered with pepperjack cheese and served on spinach leaves, bacon, and toast with orange-ginger-pear honey. 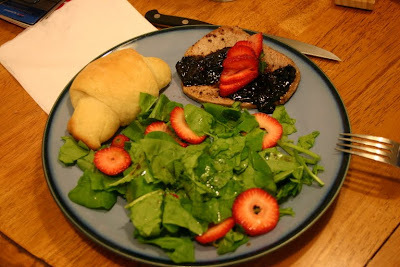 Then dinner was flatiron steaks with balsamic reduction, made-from-scratch dinner rolls, and fresh-from-the-garden salad with strawberries. If you have 22 free minutes, watch these 3 videos about the Lutheran Church in Siberia posted at Pr. Larry Beane's blog. What a wonderful reminder that the one, holy, catholic, and apostolic Church is far bigger than we realize. What an example of faithful pastors and bold parishioners. Here's the website for the Siberian Lutheran Mission Society. The day the new issue of Touchstone arrives in my mailbox is a sad day for all my other reading projects. They immediately lose precedence. In the May/June issue, Russell Moore, Dean of the School of Theology at Southern Baptist Theological Seminary, has this wonderful article on preaching: Preaching Like the Devil. Those who preach sermons as well as those who hear them would be well served by reading Moore's article. Early May brings Mother’s Day; likewise June delivers Father’s Day. So it’s appropriate to reflect on parenting. The office of parent is a holy vocation, as holy as the office of husband or wife. The work parents do is holier than that of nearly any other vocation, with the exception of spouses. The work of raising children in the fear and knowledge of the Lord is one of the holiest works to be done. So it is good to honor these estates of motherhood and fatherhood, not merely on one day a year but on every day. And it is good to model our parenting after Holy Scripture and the Catechism. From the Table of Duties of the Small Catechism: “Fathers, do not exasperate your children; instead, bring them up in the training and instruction of the Lord” (Ephesians 6:4). There are two styles of parenting: sacrificial parenting and selfish parenting. The world greatly prefers selfish parenting. Worse, our sinful flesh is inclined not toward godly, sacrificial parenting but toward self-interested, selfish parenting. Christian parents must constantly struggle against this sinful tendency. In a culture where children are a choice and little more than fashion accessories, selfish parenting comes naturally. The trend to be a hip parent is far more popular than any inclination to give up our desires, needs, dreams for the sake of raising our children in the training and instruction of the Lord. There is a distinct tension between wanting to remain the centers of our worlds and needing to heed the call from God to be fathers as He is our Father. And yet these vocations, these stations in life, these holy offices of mother and father are God-given. And as He has given them, only He can enable the work done through them. So fathers, live in repentance and faith. Learn from God the Father how to be a faithful father to your children. Learn from the St. Joseph, whom God chose to be the guardian and earthly father to the Son of God. Learn from him who taught the Scriptures to the Incarmate Word of God how to raise godly sons and daughters. Learn from him who taught Jesus how to pray to His Father to teach your children to pray to their Heavenly Father. And mothers, live in repentance and faith. Learn from the Church who raises and nurtures you as the sons and daughters of God how to raise your sons and daughters to belong to God. Learn from St. Mary whom the Lord called to be the mother to the Son of God. Learn from her who set aside her own ambitions and goals to embrace this higher, holier calling how to treasure the holy calling of motherhood when the world is quick to denigrate it. Learn from her whose few recorded words are “let it be to me according to your Word” and “Do whatever He tells you” the content of faith. So, happy Mother’s Day. Happy Father’s Day. God has given you these holy callings, and He enables you, by the forgiveness and mercy He lavishes upon you, to live in these offices and do His work. Proclaimed Your pow'r to save. To serve before Your face. When darkness hides our way. We sing our thanks and praise. And led him in Your ways. To Christ, our risen Lord. Our lives may sing Your praise. 4 All praise to God the Father! All praise to Christ the Son! Who binds the Church in one! And strive to do Your will. If you take your own life, can you still be forgiven of your sin? If you remember a few weeks ago, the topic for the Ask the Pastor was intentional sin. (You can find that ATP here.) In short, Christians do not sin intentionally. Willful, intentional, persistent sin is incompatible with faith. In fact, it wars against faith. Christians do still sin, but they always hate their sin. They do not intentionally persist in it. So what about suicide? Isn’t suicide an intentional breaking of the 5th commandment? Yes, suicide breaks the 5th commandment (as well as the 1st, 2nd, 3rd, 4th, and maybe more). But how intentional is it? So the problem with suicide is not that you don’t have the chance to repent. Repentant faith is the way of life for the Christian. Moreover, it’s incorrect to oversimplify suicide and to call it an intentional sin. Depression, which is almost always the disease that motivates a person to commit suicide, is an illness. Just like other diseases have symptoms and effects, so does depression. Among the effects of depression are despair and hopelessness. A depressed mind does not think clearly; the chemical pathways are biologically altered because of the disease. So a person does not exactly intend to sin who commits suicide. Those suffering from depression should seek both pastoral help and medical help, even if they have not had any suicidal thoughts. Background: Hope hosted this year's community Good Friday service. Unlike years past where all the members of the ministerial alliance, because we are not in pulpit fellowship with other churches in town, I was the only one presiding at the service, which was the same Tenebrae Vespers we do every year. The only difference is that this year other congregations invited themselves to our service. Why are we now participating with the ministerial alliance? For years we couldn’t participate. Ecumenism is the working together of Christians of differing confessions toward Christian unity. There are two approaches to ecumenism. One is to ignore or downplay the theological differences that have historically divided Christians in favor of presenting a unified front. The other is to be honest and forthright about what divides Christians and to work toward a common confession of the faith by resolving these differences. The first approach is not helpful. It takes a “can’t we all just get along” attitude and quips “unity not uniformity.” The problem is that the theological differences that divide Christians are not insignificant. They are huge. And they involve the proper confession of the Gospel. Since the Gospel cannot be compromised, we must not ignore, gloss over, or downplay these differences. Leaders of different denominations can and should have conversations together that acknowledge these differences and seek to come to a common understanding. 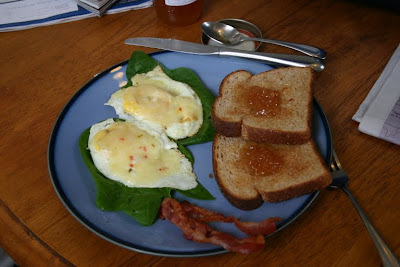 This is the second approach. Lutherans of the Missouri Synod have always preferred this second approach to ecumenism. It’s more difficult, to be sure, to be honest and upfront about how our different confessions of the faith. But because we care about the pure Gospel of Jesus Christ, we must. So the Lutheran Church-Missouri Synod has always taken a careful approach when she engages with Christians of other confessions. In most clergy alliances, that looks like this: we can participate together and cooperate in service toward the community, but, because we believe differently and refuse to ignore those differences, we cannot cooperate in matters of worship. This was ecumenism done correctly. The service and the preaching were unapologetically Lutheran. And no one was welcome to preside in the liturgy who was not in full agreement with us. I don’t know what pastors have done in the past. Because genuine ecumenism is so difficult in a culture that tries to downplay differences between Christian denominations, deciding not to participate at all is completely understandable. But there’s a benefit to be reaped from being in conversation with other Christians and from serving our community together significant enough to make this kind of ecumenism worth the effort. Check out this post at Mere Comments.